To some casual observers, ladybugs (or lady beetles) are colorful symbols of good luck—harbingers of fortune and fame. Gardeners value them for their utility as ravenous insects that prey upon plant pests. They buy them by the hundreds online or from garden centers, and then free them to hunt. 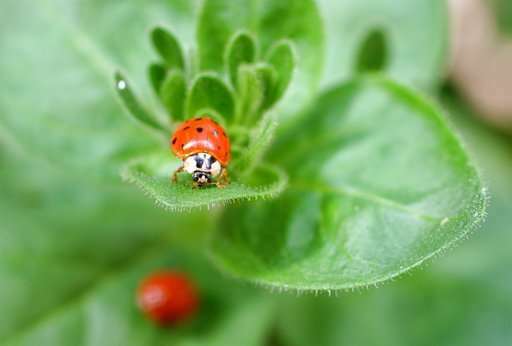 The Xerces Society for Invertebrate Conservation, a pollinator preservation group in Portland, Oregon, doesn't recommend buying or releasing non-native lady beetles, especially for yards and gardens, said Executive Director Scott Black. "Not only do they not really work—there are lots of potential negative implications for beetles where they are collected and where they are released," Black said. Many lady beetle species overwinter in large numbers in California's Sierra Nevada. "In the spring, adults fly down from the mountains to the valley and coastal areas where they play an important role in controlling plant pests," Xerces says. "Large quantities of lady beetles (in the genus Hippodamia) are collected every year at overwinter sites in the Sierra Nevada and sold commercially." While it may be cheap to buy a bag or more of ladybugs to patrol residential landscapes, it's difficult if not impossible to keep these miniature mercenaries from wandering. Adult beetles need to migrate before they start feeding or laying eggs, so they quickly head to parts unknown when released. "Twenty-four hours later I can find about six in the greenhouse after releasing a bag of 1,500," Cranshaw said. "Which means 1,494 largely vanished somewhere in that period. And I do not see any laying eggs for a few weeks." Learn how to identify the insects as they mature. "Don't kill them just because you don't recognize them," he said, a reference to the fierce-looking ladybug larvae. 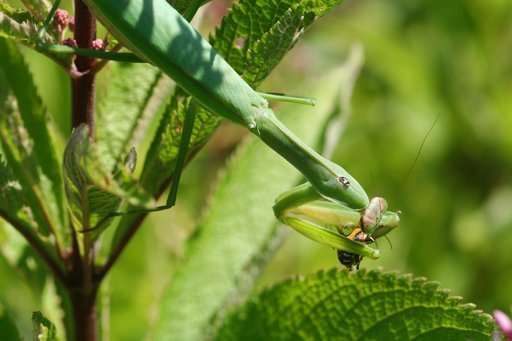 "Praying mantises are popular, but I'm not high on them, either," he said. "They're generalists and will eat anything out there, including bees and butterflies." Cranshaw suggests using green lacewings, predatory midges and parasitic wasps for insect control. Look up "beneficial insectaries" for suppliers. "Sometimes we're simply too trigger-happy," Black said. "We're trying to control things we don't really need to control. Sometimes all you have to do is spray pests like aphids and spider mites off (with water) or use some insecticidal soap. "Be more attuned to natural systems," he said.